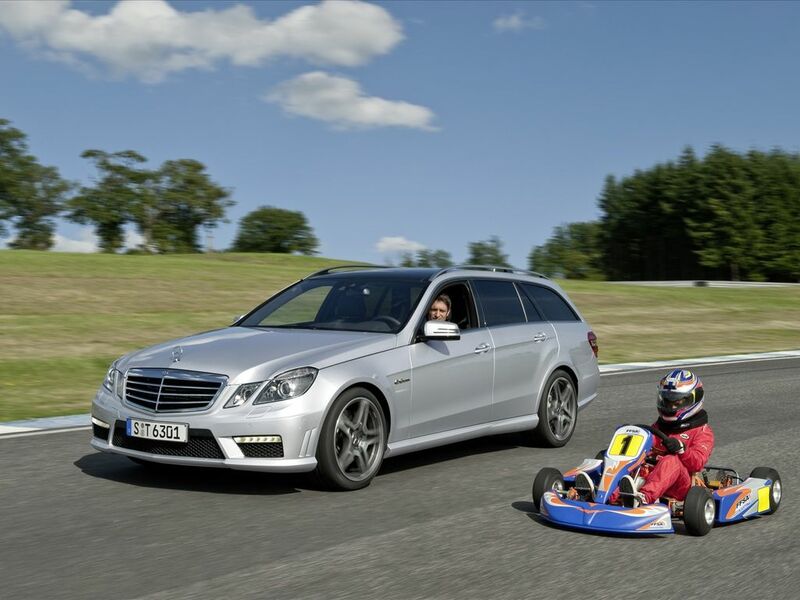 Pole position for the new E 63 AMG Estate: the high-performance estate develops 386 kW/525 hp, accelerates from 0 to 100 km/h in 4.6 seconds, offers a maximum luggage compartment capacity of 1950 litres – all with a relatively low fuel consumption of 12.8 litres per 100 km (combined, provisional figures). With these dream figures, the new E 63 AMG Estate adds up to an extraordinary combination of driving dynamics, high utility value and superb efficiency. The top-of-the-line E-Class not only features its distinctive styling but also the all-new AMG RIDE CONTROL sports suspension including electronically controlled damping system and a new front axle. 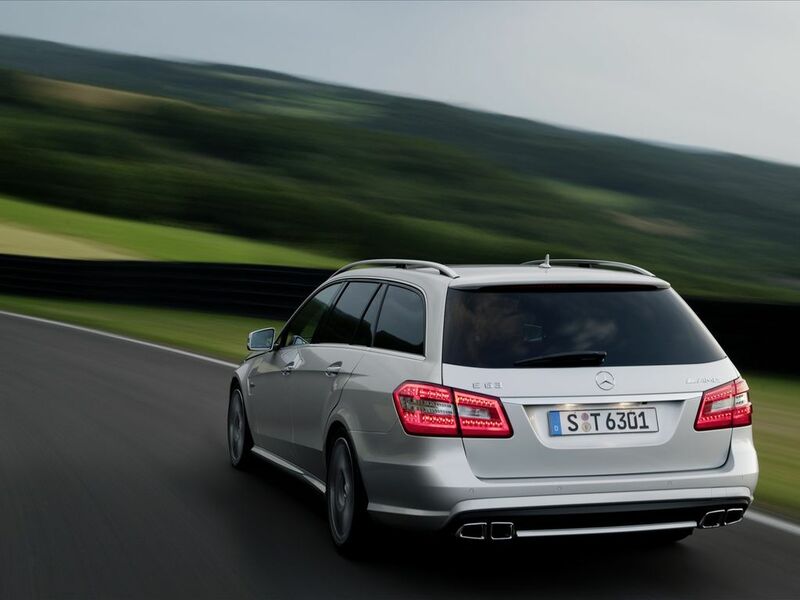 A composite ceramic braking system is available for the first time for the E 63 AMG Estate. The unrivalled combination of groundbreaking driver assistance systems raises the bar in terms of active and passive safety in this vehicle class. Largest luggage compartment and lowest fuel consumption – the E 63 AMGEstate sets new standards. 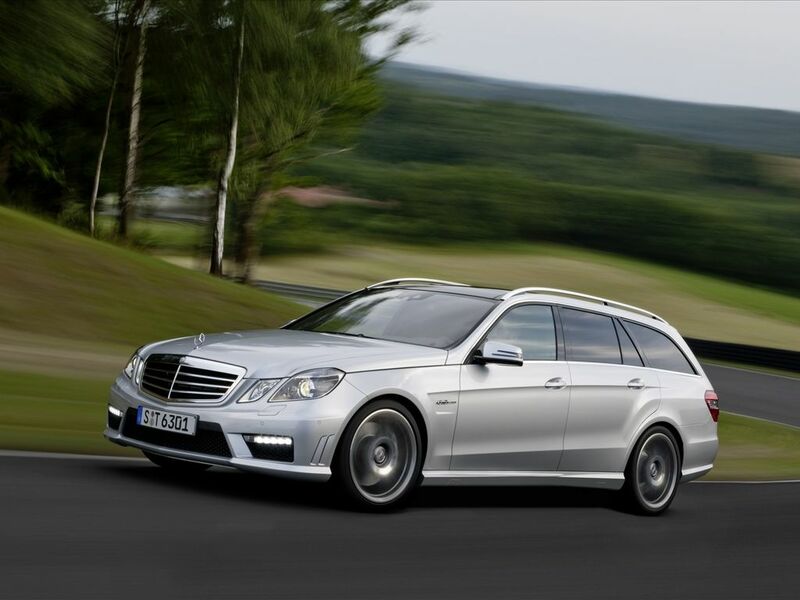 With a luggage compartment capacity of 695 to 1950 litres and fuel consumption of 12.8 litres Super Plus per 100 kilometres (NEDC combined), the new high-performance estate from AMGstands on pole position. None of its rivals can match this extraordinary combination of performance, utility value and efficiency. The AMG 6.3-litre V8 engine with its 386 kW/525 hp develops 8 kW/11 hp more than the previous model, yet betters its fuel consumption figures by almost twelve percent. This improvement was achieved thanks to a whole raft of efficiency-enhancing measures. The on-demand delivery of fuel and generator management with recuperation of braking energy on the overrun has helped reduce fuel consumption, just like the AMG SPEEDSHIFT MCT 7-speed sports transmission: a wet start-up clutch that runs in an oil bath replaces the conventional torque converter, while the even more fuel-efficient driving mode "Controlled Efficiency" utilises early upshifts to keep engine speeds as low as possible. The new E 63 AMGEstate delivers a compelling proposition with its two fundamentally opposed traits: it masters the sedate driving of an executive estate suitable for long journeys just as consummately as the enormously dynamic manoeuvres on the racetrack. The AMG high-revving, naturally aspirated engine with a displacement of 6208 cc and 630 Nm of torque impresses with its agile responsiveness, muscular power delivery and great flexibility. 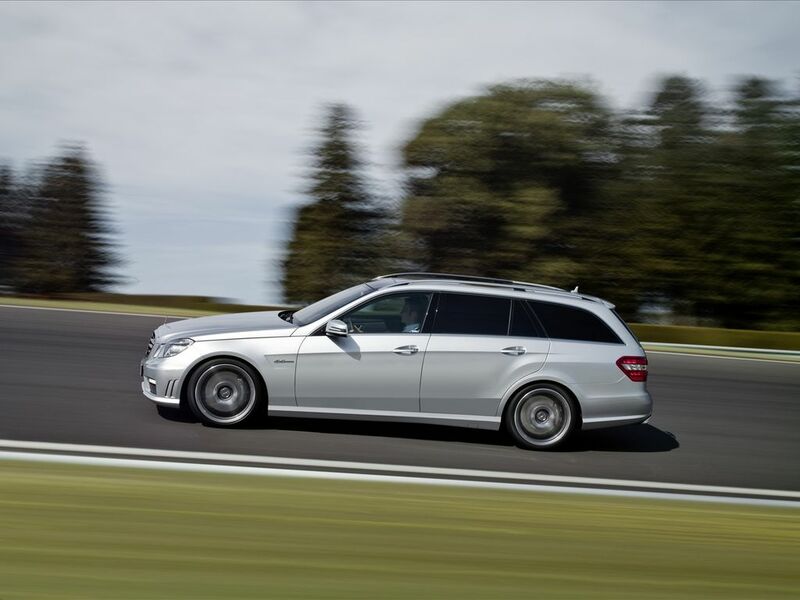 The E 63 AMG Estate reaches 100 km/h in just 4.6 seconds, with a top speed of 250 km/h (electronically limited). The newly composed V8 sound is a thrilling accompaniment for mile after mile, while the smooth-running engine guarantees typical Mercedes ride comfort. A newly designed water cooling system ensures maximum endurance even under enormous stresses. The AMG SPEEDSHIFT MCT 7-speed sports transmission meets the driver's most disparate requirements: the transmission is equipped with four drive modes: "C" (Controlled Efficiency), "S" (Sport), "S+" (Sport plus) and "M" (Manual), which can be selected using a rotary electronic switch in the AMG DRIVE UNIT. In the even more fuel-efficient drive mode Controlled Efficiency, the transmission shifts the gears decidedly smoothly, and the transmission control unit is programmed to perform early upshifts to keep engine speeds as low as possible. In Sport plus and Manual modes, the 7-speed sports transmission allows gearshifts to be performed in 100 milliseconds. Partial suppression of individual cylinders by interrupting ignition and injection briefly during gearshifts under full load leads to considerably faster shift times. Fast, spontaneous multiple downshifts ensure first-class agility in conjunction with the double-declutching and RACE START function: this enables the E 63 AMG driver to call on the maximum acceleration potential automatically. Like the engine and power transfer, the newly developed AMG RIDE CONTROL sports suspension offers the ultimate in individuality. Outstanding driving dynamics and typical Mercedes long-distance comfort go together as an optimum synthesis in the E 63 AMG Estate. While new steel spring struts are used on the front axle, the rear suspension features AMG-specific air springs. The advantage of this solution is that the front steel springs ensure more sensitive responses while the rear air struts with their automatic level control system keep the vehicle at a constant height irrespective of the load. A new, electronically controlled damping system automatically varies the damping characteristics according to the driving situation, reducing the roll angle of the body. The result is instant modification to provide the best possible ride comfort together with the greatest possible agility. In addition the driver is able to choose between the three suspension modes of Comfort, Sport and Sport plus at the touch of a button. The E 63 AMGEstate is also equipped with a newly developed, dedicated front axle with a 56-millimetre wider track, a tubular stabiliser, new control arms, new elastokinematics and new hub carriers for more negative camber – thereby providing more grip when taking bends at speed. This is a highly sophisticated axle design whose principle has already proved its worth in the C 63 AMG Estate. The rear axle likewise has more negative camber, optimised elastokine-matics and a new subframe mounting for greater stability at the physical limits. A more direct steering feel comes courtesy of the all-new speed-sensitive rack-and-pinion steering. The steering ratio of 14 : 1 is 22 percent more direct than in the standard production models, while a more rigid steering column plus the reconfigured characteristic mapping of the speed-sensitive servo assistance ensure better steering precision and improved road contact. The 3-stage ESP® familiar from the SL 63 AMG and C 63 AMG enables individual settings to be selected – with clear benefits in terms of driving pleasure. The ESP® button in the AMG DRIVE UNIT allows the driver to choose between " ESP ON ", "ESP SPORT" and "ESP OFF" – with the currently active mode shown in the central display of the instrument cluster. Perfect deceleration even when driving extremely briskly is ensured by the AMGhigh-performance braking system with 360-millimetre, internally ventilated and perforated brake discs all-round. Particularly resistant, motorsports-tested composite technology is used at the front axle. The newly developed, optional ceramic composite brakes with larger brake discs guarantee even better brake performance and a longer service life. The ceramic brake discs will perform reliably at even higher operating temperatures thanks to their greater hardness, all combined with an impressive weight reduction of around 40 percent. The reduced unsprung masses translate into even more agile handling, particularly on fast motorway bends. Optimum grip is ensured by the 18-inch, titanium grey, high-sheen AMG five-spoke light-alloy wheels with a width of nine and 9.5 inches and mixed tyre sizes of 255/40 R 18 at the front and 285/35 R 18 at the rear. Lightweight, forged 19‑inch AMG light-alloy wheels with size 255/35 R 19 tyres at the front and 285/30 R 19 at the rear are also available as an option. The newly developed front axle with its wider track calls for wings that are 17 mm wider. The stylish integrated "6.3 AMG" lettering leaves the connoisseur in no doubt about the unique credentials of the high-performance estate. The AMG bodystyling also includes a front apron with large cooling air intakes, air outlets at the side and the AMG-specific LED daytime driving lights. In conjunction with the optional Intelligent Light System (ILS), the E 63 AMG Estate is equipped with tinted main headlamps. The side skirts and the rear apron with its black insert also guarantee the car's striking looks. Both styling features combine effortlessly with the graceful line that follows the rear wheel arches and lends a clear shape to the imposing, muscular contours of the rear wings. The standard specification includes ultra-fast LED tail lights and direction indicators. To create a lasting impression – on the eye and the ear – the sports exhaust system has two newly designed, chrome-plated twin tailpipes. Thanks to the wheelbase that has been enlarged by 20 millimetres, the E 63 AMGEstate not only offers better ride comfort but also more space and luggage compartment capacity than the previous model. With its capacity of 695 to 1950 litres, the luggage compartment is not only larger than before but also leaves the competition standing when it comes to the essential luggage compartment dimensions and capacity. This highly practical concept paves the way for numerous options for transporting sports equipment, holiday luggage or high-quality designer furniture. 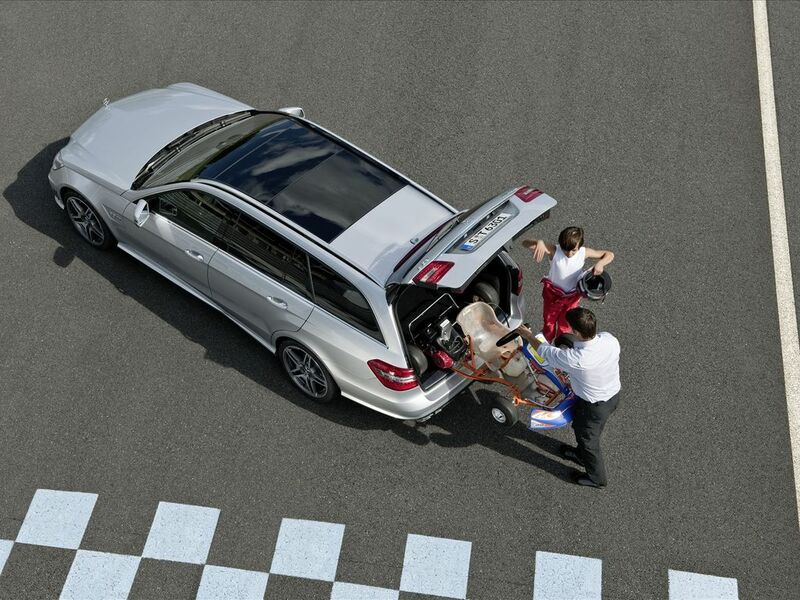 Standard equipment for the E 63 AMG Estate includes the main components of the EASY-PACK system such as the folding load compartment floor with two loading levels and collapsible crate, the load compartment cover, quickfold to fold down the 1/3:2/3-split rear backrest easily and the EASY-PACK tailgate, which can be opened and closed electrically. The newly designed interior of the high-performance estate is an exciting blend of high-grade materials and functional sportiness. 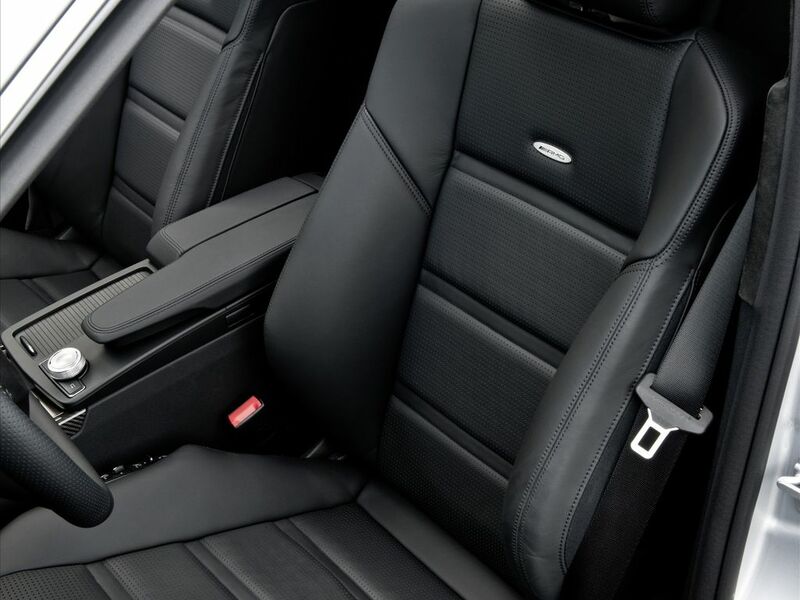 Exclusive features include the dedicated, electrically adjustable sports seats with improved lateral support and the sports steering wheel in a four-spoke design with aluminium shift paddles. The AMG DRIVE UNIT provides adjustments for the MCT sports transmission, the 3-stage ESP®, the suspension set-up and the AMG drive modes. The E-SELECT selector lever in the centre console is a completely new feature for the DRIVE UNIT. The driver can shift directly between R, N and D simply by nudging the lever, all thanks to drive-by-wire; the parking lock P can be selected conveniently by pressing a button. Standard equipment also includes high-grade leather upholstery in three different colours, the AMG instrument cluster with an AMG main menu as well as the door entry sills with AMG lettering and a sports pedal cluster – both in brushed stainless steel.